You can reach us by submitting the form below or call us at (636) 928-1000. After you submit your information, you’ll be able to download the guide — Our Quick Facts About Our Stone. And rest assured, your contact information is safe with us. We won’t share it or send you spam. Not sure what is the best choice for your project? 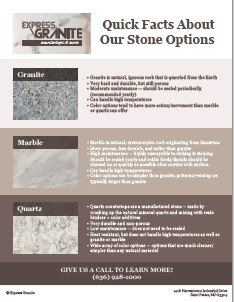 Of course, we will help you decide, but we’ll also send you some Quick Facts About Our Stone Options. Just fill out the information below, and you can download it right away.